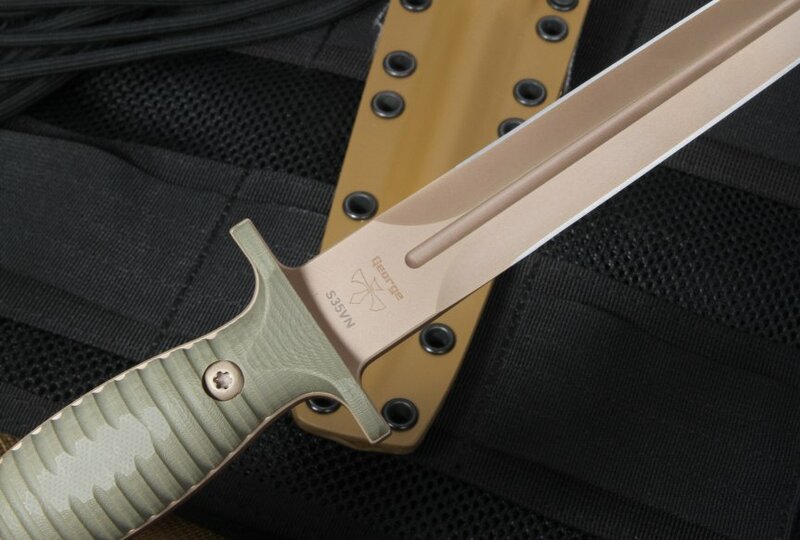 "Real combat veterans are behind this tactical fixed blade from Spartan Blades. 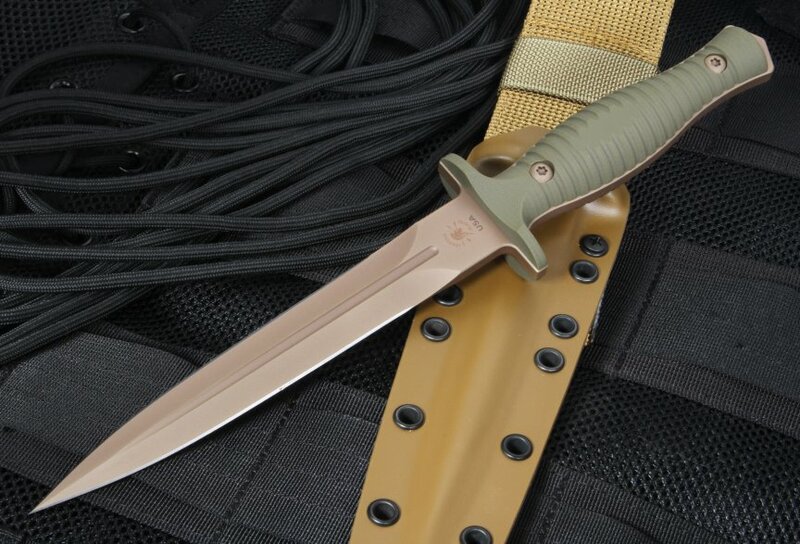 Les George has the experience and knowledge for what is needed to design a combat dagger. The design, construction, and materials get my full support." 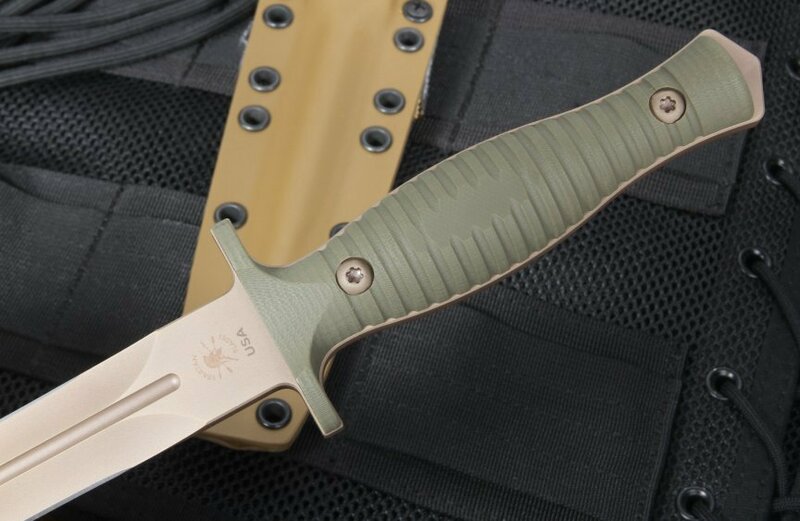 Named after gifted and prolific knife maker; Les George - the Spartan Blades George V14 Dagger in flat dark earth and green is a beauty to behold. This dagger is under 10 ounces but a full 11 5/8" in size. The blade is an impressive stainless CPM S35VN Steel with SpartaCoat and PVD Zirconium Nitride. The blade size is 6 3/4" with a blade thickness of an impressive 1/4". Each blade is double tempered, vacuum heat treated, and four symmetrical bevels were hollow ground to ensure the blades has durability, toughness, and edge retention. It is also a blade you can rely upon with the 0.25-inch precision ground thickness. You will love the comfortable and confident grip due to extra attention to detail. 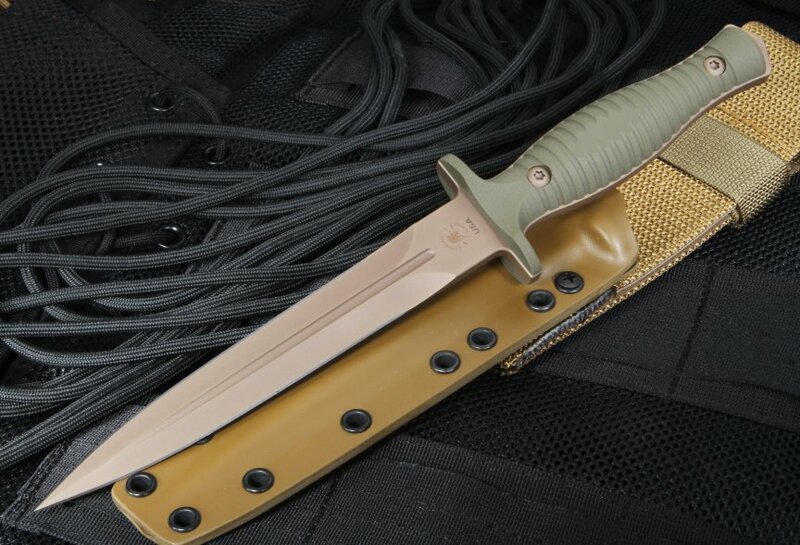 For instance, the oblong shape with flats on each side provides help with indexing and you are able to use the knife in all kinds of visibility conditions - making it a must have in combat situations. 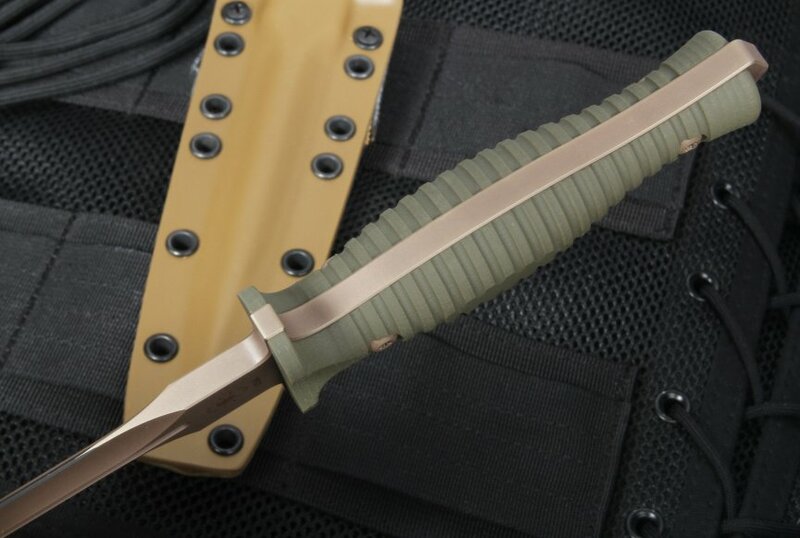 It is important to note that this knife was the winner of the BLADE 2014 Collaboration Knife of the Year and for all of the reasons stated above. 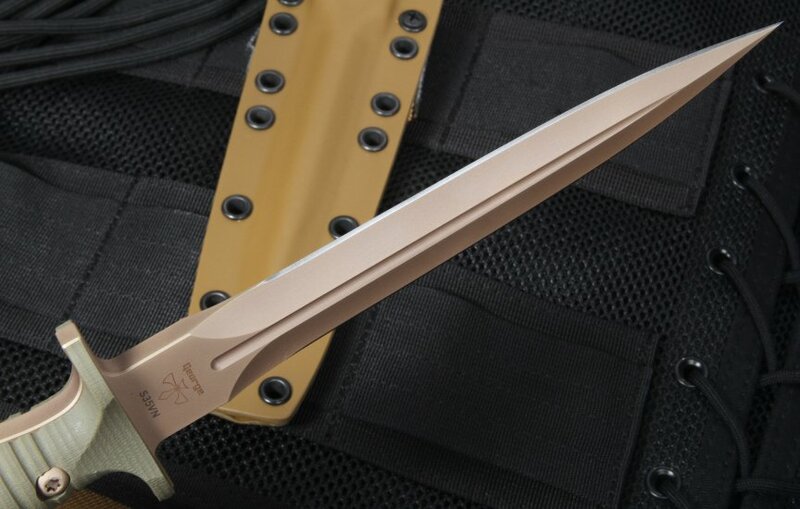 So if you are looking for something to use that is a modern interpretation of a classic fighting knife, you will never go wrong with the Spartan Blades George V14 Dagger. Just received my V-14. I've admired this knife for years and finally pulled the trigger. It's a beautiful, single purpose knife. Fit and finish is excellent. The dark earth blade coating almost has a bronze look to it, very attractive. Grinds are symmetrical. Handle is comfortable and grippy. The blade tapers to a needle point. The edges are not razor sharp, but for the intended purpose they don't need to be. This isn't a utility or camping knife. It's a stabber, meant to put a bad end to someone's day. I'm sure the edge is plenty sharp enough to easily penetrate clothing and flesh, which is the design function of such a blade. The sheath is very good, Kydex with an adjustable heavy ballistic nylon belt loop. The knife fits firmly into the sheath, as it should. Pressing your thumb against the sheath allows a quick and easy draw. If you're a dagger fan, buy it. You won't be disappointed. I wish it were less expensive, but I can find no flaws in the design or execution of the knife. I had purchased one a little over a year ago. Loved the overall design and craftmanship immeasurably. However much I was attached to it, I gave my first V14 dagger to a very close friend and colleague from New Zealand. Just had to replace it and did just that recently. Great feel and I particularly like the unusual color combination. I've seen few knives of this size that are this stable and balanced. Service and delivery were also top-notch, which is status quo for Knife Art.